Hopefully you have some time off to relax, watch a movie, or crochet. Crochet is relaxing to me..... most of the time, except when I'm trying to figure out a super complicated pattern. Sometimes it feels like trying to learn a new language! Ch 2 does not count as dc. I was a bit sad that my Christmas crochet is over - one of my projects was your hat, which I gave to my sister. I'm excited to see this scarf pattern! I think I need to make it. Nice! I've made a chevron blanket before but I might have to add chevron scarf to my To Do list for this year. I'm off to buy suitable yarn for this project, widened it would make a great Prayer Shawl. Thank you for sharing. Count me as a new Follower. Scarfs are so in this year my daughter loves them and I have quite a few skeins around. I made this same one years back when my neice and my youngest were begging for Scarfs out of a cool neon gradient, I did the same but in single stitch for a warmer scarf but this is so nice for accessory. Your scarf is lovely!! And your right, crocheting is relaxing a lot of the time, but sometimes it's just not haha. Or, when counting stitches...if someone talks to me I am done for, lol. Thanks for sharing!! Very pretty :-) Thanks for the great pattern. I found you through the Crochet website and I had to tell you how much I love this pattern. I really love the look of a chevron and usually make it with multiple colors. While pretty, I HATE weaving in all those ends. I love the idea of a single color chevron. I'm making this tonight. Thanks! 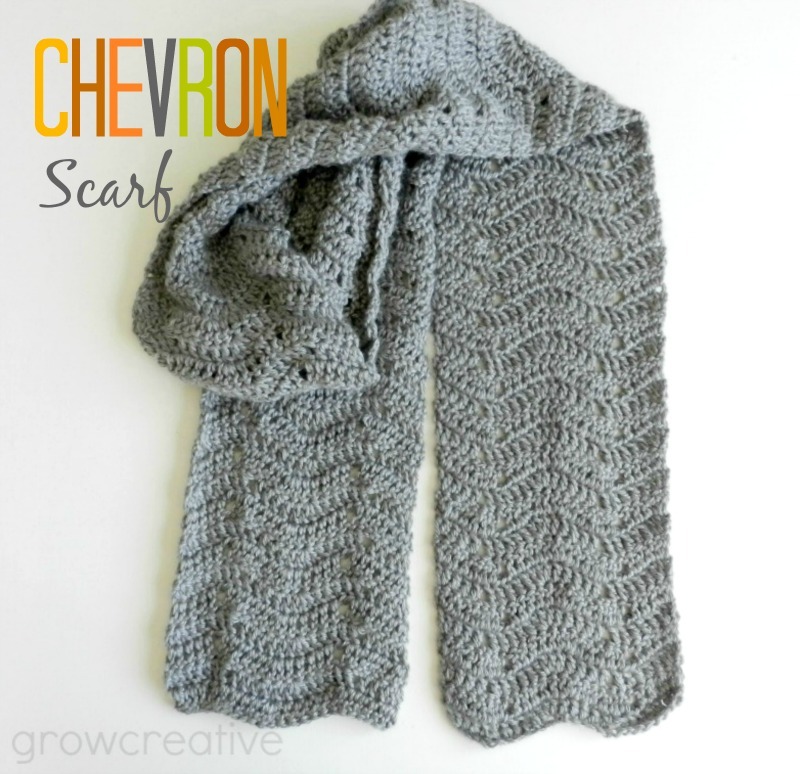 Beautiful use of the crochet chevron stitch! 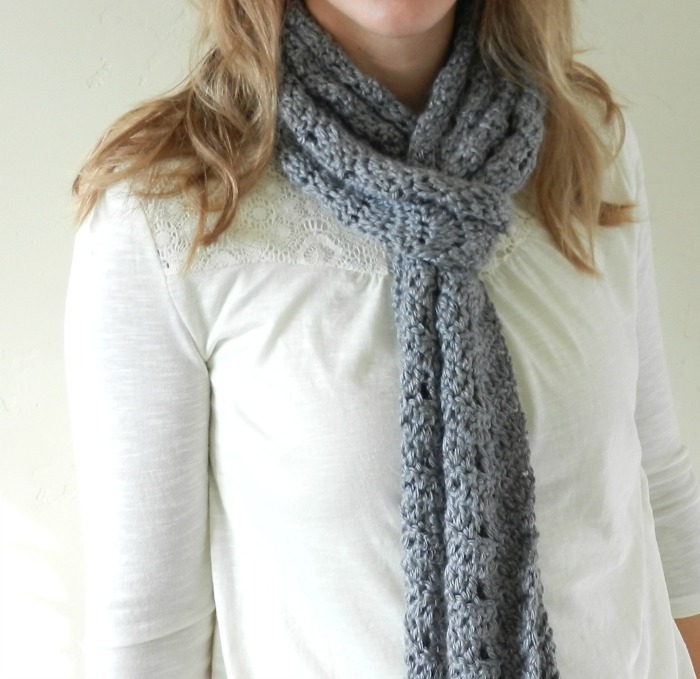 I love the look of this scarf! I must try it this weekend. Thanks for sharing! May I sell in a local shop and give you credit? My patterns are for personal use only. Sorry. I do sell some items made from my patterns, so I don't want my patterns used for items for sale. Thank you for taking the time to ask and best of luck to you with your shop! Thank you! I will make one just for me....love it! Thank you for this wonderful pattern! I needed something a little more challenging than just rows, but something that was still easy and relaxing to do. I made this scarf on my summer vacation and I'm wearing it to death now that it's colder. I made it in 3 balls of Lion's Brand Amazing Yarn (half wool/ acrylic-multicolored self striping). I love the changing colors, but it might have taken away from the beauty of the pattern. I still think it turned out nicely. Thanks so much. I'm glad you made this scarf! I've never tried that type of yarn, but it sounds really nice and warm. Happy Holidays and thanks for visiting my blog! I'm sorry you are having trouble. Without seeing what you are doing it is hard to tell where the problem is. When I count up the dc stitches in the first row, they equal exactly 25. Is there any way you could share a photo on my FB page or describe the problem in more detail? I have started this 4 times & ripped out all 4 times because it just doesn't line up properly. I got the 25 stitches, but when doing the 2nd row, if I do the 5 dc (after initial 2 dc in first dc), it throws off the pattern. I changed to 3 dc (after initial 2 dc in first dc) and then skipped 2, continued on with 5 dc and 3 dc in next st...it works out that way but not as written. Sorry! This is also what I had to do at the end of the rows; 2 DC in first st and DC in the next 3 st. and then it is all lined up right. I had the same problem as the person above and what I did was in the initial chain I added 2 more chains and it worked out perfectly. It is are very pretty pattern and I love that it is in one color!! Love this pattern! Have several rows started and I'm very happy with the results. Thank you for the free pattern. One question, if I wanted to make this wider what multiples of chains do I use? Sorry it's taken me so long to get back to you Gayle... I've been recovering from surgery. If I remember correctly, I think you make this in multiples of 13 plus one or two- I can't remember specifically. Best of luck to you! Sounds like an easy pattern as I made an afghan in this pattern. Got into a crochet club & making scarfs for charity. Thanks a lot. I've tested this pattern several times and figured out how to correct it so people can create the actual scarf shown in the photos. Row 1: 1 dc in 3rd ch from hook, dc in next 3 ch, skip 2 ch, dc in next 5 ch, 3dc in next ch, dc in next 5 ch, skip 2 ch, dc in next 3 ch, end with 2 dc in last ch. Turn. Row 2: Ch 2, dc in same place, dc in next 3 dc, skip 2 dc, dc in next 5 dc, 3dc in next dc, dc in next 5 dc, skip 2 dc, dc in next 3 dc, end with 2 dc in last dc. Turn. Rows 3- 107: Repeat row 2. There will be holes in the pattern wherever you skip 2 dcs. This appears to be a design feature. The holes will line up properly using this version of the pattern. ty orig pattern didnt line up correctly! Thank you so much. I tried to start it with the original instructions and quickly discovered it wasn't going to come out right! I appreciate your corrected pattern. Hello, thank you for this. What should I do if I want to double the width of the scarf, start with ch 50 and repeat it twice?